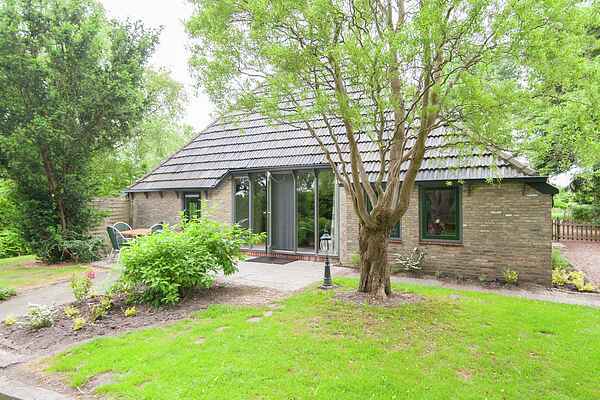 Detached farmhouse in eastern Friesland, in a rural and wooded area. The farmhouse is situated on a quiet road and features a fenced garden (2000 m2) with a view of the meadows. Across the house you'll find the Haulerwijkstervaart, ideal for fishing enthusiasts. The farmhouse is furnished in a simple way and features all the necessary facilities for a wonderful peaceful weekend with your family or a group of friends. The open kitchen, living room and dining room are located on the ground floor and provide access to the French doors towards the green garden. The farmhouse has 6 bedrooms, including a walk-through bedroom on the first first floor, which can be accessed by way of a steep staircase. In the recreation room of the farmhouse you'll find a foosball game, a table tennis table and a darts game. In the garden the children can enjoy themselves on the playground equipment. You can also use the skelter from the shed. There are plenty of biking and walking possibilities here, and canoeing is also possible (canoes can be rented in Bakkeveen at 5 km). Assen (20km), Groningen (30km) are absolutely worth a visit. The village of Appelscha is 15 km away; this is an area where you can enjoy nature, serenity and space, but where you also have many options for activities.